Private Label / Store Brands can be key differentiators for Retailers and can be used as a strategic weapon that separates a Retailer from its competition. Once Shoppers get hooked on a Retailer’s Private Label / Store Brand, they have no choice but to shop there. But how can they achieve this loyalty? Create a better private label strategy with two CatMan Foundations. Retailers should apply principles from Category Management Foundations to their Private Label brands. This means that these brands shouldn’t be kept in a separate department without consideration for total category and Shopper (including the tactics). Separating Private Label brands limits the opportunities for those brands to grow. 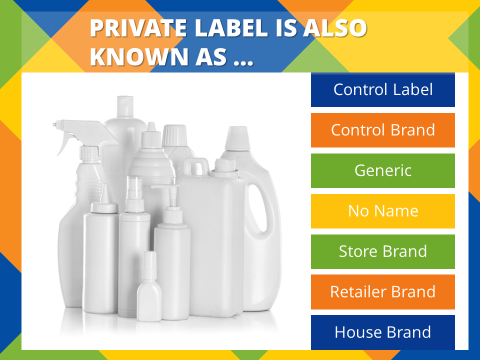 Private Label brands are typically those manufactured or provided by one company for sale under a Retailer’s brand name. They are available in a wide range of categories and are often positioned as lower cost alternatives to national brands. Over the past few years, some Private Label brands have been positioned as "premium" brands to compete with existing "name" brands. Understanding target Shopper for their brand(s), including demographics and purchase behaviors. Determining which formats, banners and/or store clusters match best with their brand(s). Understanding store brands at a category level, through category assessments and tactical analysis, ultimately establishing guidelines for the Private Label brand as part of a total category solution that focuses on Shopper. This strategic approach to Private Label allows Retailers to establish overall corporate strategies, including some basic tactical strategies. It gives Retailers the ability to create target shares and tactical results based on how the private label brand performs within different categories. Retailer X manages a Hard Discount store format. Let’s assess their Private Label brand competition. Can you see how this is a very limiting perspective? The reason it is limited is because it lumps all of the national brands together, without consideration for the Shopper and their differences across brands. By adding in a breakout of key national brands, Retailer X can better understand which brands are most and least developed compared to total market. In the next example, Retailer X has broken out their own store brands into Generic, mid and Premium private label, rather than clustering together three distinct private label brands with different target consumers across different retail formats. Now, Retailer X gets a much better understanding which national brands and private label brands are “most” and “least” developed relative to their total category share of market. Red indicates brands that are less developed than the total category share, and green indicates more developed. 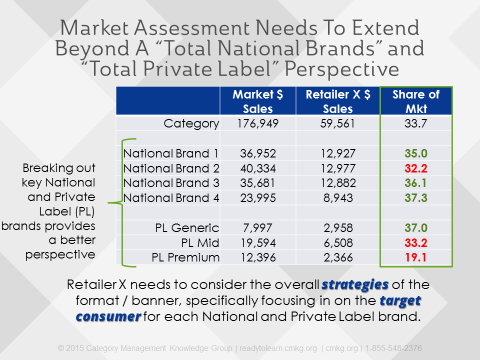 Before Retailer X can establish strategic target shares for their key national and private label brands, they need to consider the overall strategies of the format or banner, with specific focus on the target Shopper for each national brand and private label brand. Who is the competition, really? interact most with their Private Label brands. Understanding these relationships will provide clearer knowledge of competitors and the ability to set even better targets. In the following example, a volume index greater than 100 means that the brand sells more volume in that segment relative to the size of the segment. Highly developed volume indices are highlighted in green. Retailer X wants to understand which national brands have similar consumer demographics to their Generic branded product. The Generic brand consumer is highly developed in large households, and in mid-income levels. This matches closely with National Brand #4 (indicating that it’s the closest competitor to Generic label). The Generic is also an excellent match for the Retailer’s hard discount target consumer, who is a larger household with low to mid-income levels with a strong focus on low price. 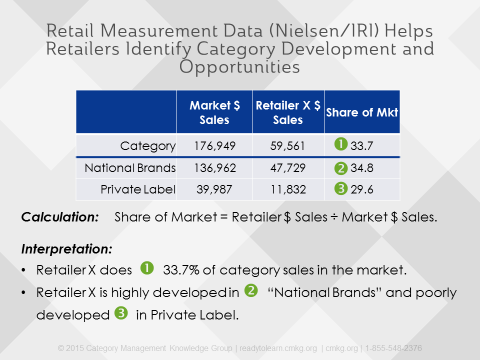 Retailer X can get even more compelling competitive private label insights through a cross-brand interaction analysis. This analysis can be purchased as a subset of consumer panel data. Geographies and product hierarchies can be customized for the analysis (it’s highly recommended that Private Label brands be broken out individually and lumped into one grouping). 42.8% of their total category dollars were spent on their brand. This is also known as their “loyalty” number (or share of wallet). The grey numbers highlight each brand’s loyalty, which is where the brand intersects itself in the table on the top and on the left. 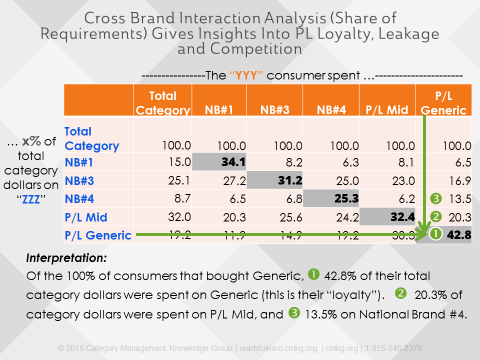 Generic is the most loyal, with a 42.8% share of requirements. 20.3% of the Generic consumers’ category dollars were spent on Private Label Mid, and 13.5% were spent on National Brand #4. This number is less than the interaction with National Brand #3, but if you compare the % of category dollars going to National Brand #4 across the other brands, this switching is significantly higher. To summarize, National Brands #3 and 4 , plus Private Label mid-tier brand, are the biggest competitors for Retailer X’s Generic brand. Now, Retailer X has a much better understanding of which national brands compete with their store brands. From here they can set more strategic target shares across their private label and national brands within the category. 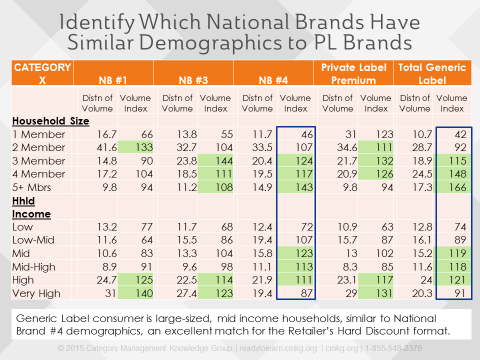 Different national and Private Label brands have different Shoppers. Take your analysis to a deeper level and you will be able to make much more strategic store brand decisions to improve total category results that consider Shopper needs and differences. Rather than targeting all Private Label and National Brands equally to gain market share, Retailers should target the ones that they know compete more directly with each of their own brands, based on Shopper insights from the panel data. Vendors shouldn’t ignore their Private Label competition (or hope that it goes away!). They need to understand the positioning of their national brands relative to their Retailer’s store brands, including trends, Shopper differences, brand interactivity/leakage and tactical insights. The opportunity is for Vendors to partner with Retailers, where appropriate, to bring consumers and Shoppers multi-tiered category solutions. Want to learn more? All of these principles and analytics are derived from our certified category management training courses and certification-based programs that are designed to make you more strategic in your decisions and recommendations.